W. L Fuller, Inc. has been manufacturing, recommending, supplying, and distributing tools to cut woods, plastics and metals for over 60 years. They produce the best quality tools made in the USA. to predrill, countersink, counterbore and plug for screws and bolts of all different sizes and shapes. Their high speed taper point drills are specifically designed to predrill for wood screws of various sizes and lengths. Their four flute countersinks, designed to mount on the taper point drill, combine pre-drilling for the screw threads, clearance drilling for the screw shank, counterboring for a wood plug (if needed) and countersinking for the screw head - in one operation. The plug cutters are designed to produce wood plugs accurately sized to match their counterbores, so the plug fits right every time. Made of the best quality steels, and heat treated for long tool life, the tools are designed to save you time by eliminating steps and increasing tool life. 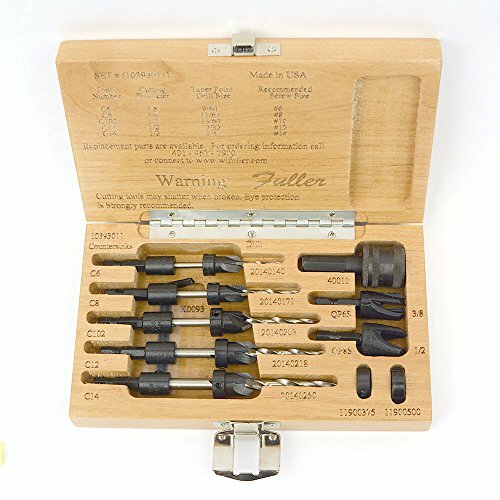 This set is designed to be used with wood screw sizes #6, #8, #10, #12, and #14. Includes quick change chuck, countersinks, counterbores, tapered drills, stop collar and plug cutter.